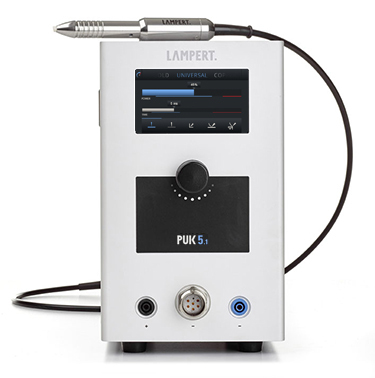 Lampert PUK 5.1 precision micro welder with 10x microscope, argon regulator and tack welding kit. We include everything you need to get started right out of the box. So we include the Argon regulator & the tack welding kit (added value of over $300.00) but not the Argon gas bottle. (D size is best). These can be obtained from BOC, Bunnings and other good gas outlets. The new PUK masters the welding of accessories, applying metal, fastening work, welding eyelets, sealing pores, generating seams, welding precious metals incl. silver as well as copper and bronze and all alloys suitable for welding, even with material thicknesses of less than 0.2 mm. This is very close to laser welding in terms of the working method and range of applications. On workpieces with a thickness of 0.2 mm or greater, it is an effortless process to produce robust welds. The PUK 5.1 precision welding equipment puts a whole host of possible applications for jewellery production at your fingertips. Structures made from sheet or wire elements can be just as easily done as tack welds and repairs to jewellery parts, restoring missing parts or filling of pores by applying welding wire - and many more options, the PUK 5.1 is able to produce anything from the smallest of repairs to volume production, and even the most extraordinary of new creations. As soon as the tip of the electrode of the welding hand piece touches the workpiece, the welding process starts automatically. At the contact point, under an inert gas atmosphere, a melting process with a diameter of between 0.3 and 3.0 mm takes place (depending on material and setting). Faster progress to better results – "blind operation" with single-handed operation. Concentration remains focused on the workpiece. Even higher-performance LED lighting in our new premium welding microscopes. More uniform illumination of the working area - more flexible use of the microscope. These microscopes can also be used as fully equipped workplace microscopes - not just for welding. 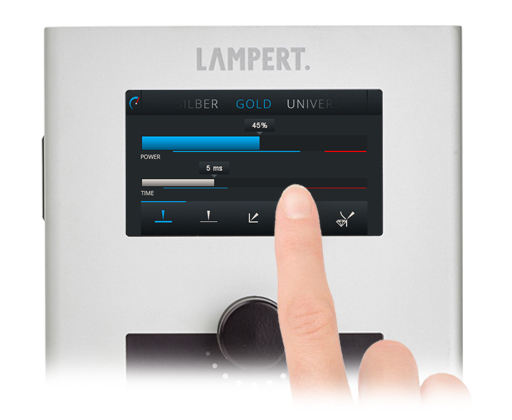 Setting of parameters for "Power", "Time" and menu navigation with one single rotary controller. Optimised welding parameters for copper and bronze. The PUK takes over full control despite the high thermal conductivity. Suitable for many applications including jewellery, optical, dental and micro engineering.